As you guys know, I have an irrational love for the International Scout II by Johnny Lightning. The Desktop Rock Crawl Crew (DRCC) is now up to 8 members, and will hopefully continue to expand. My other irrational truck love, though, is for the Toyota FJ. I’m so not a Toyota guy, but I think I’d make an exception for a Land Cruiser. They’re classic, charming, but also über capable and beastly. And, like the Scout, Johnny Lightning makes a 1:64 version that is just money. The FJ as we all have come to know and love it evolved from basically a Toyota-produced Willys Jeep during the Korean war in 1950. 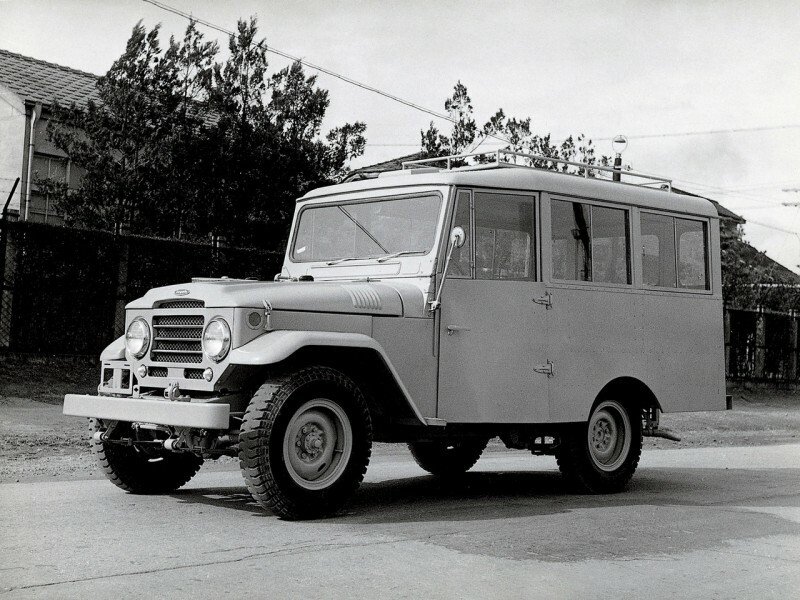 That, then, turned into a full-Toyota designed and built light truck (J20 and J30) that was both an answer to the aforementioned Willys, as well as the Land Rover Series I. The FJ40 was launched in 1960, and produced, in some form or other, in some part of the world or other, up until 2001. The fun thing about the FJ is that it came in basically endless permutations of body styles and engines. 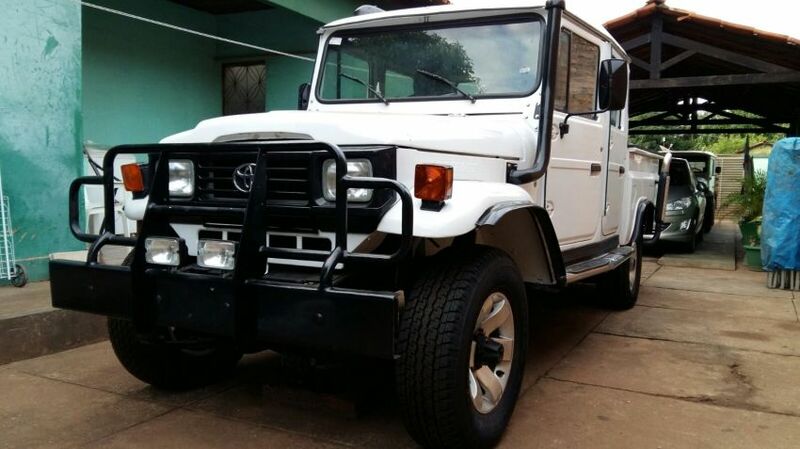 Between diesels, gasoline engines, inline sixes and fours, and even a Mercedes engine in the Brazilian Bandeirante models in the late 80s-early 90s. 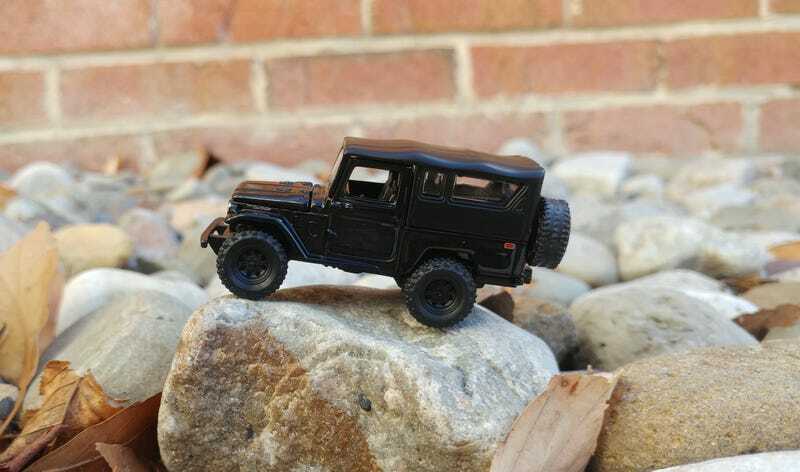 In terms of styles, there was of course the short wheelbase FJ40 (think: the Matchbox one), in soft- or hard top. Then there was the FJ43, a medium wheel base version with soft- or hard top, and the FJ45/47, a long wheelbase model that came in a four-door station wagon, two-door hard top, three-door hard top (also known as the Troopie in Australia), or a two-door pickup. Based on that knowledge, and with the blessings of our old friend Tinfoil Hat/@tippityplop, we can confidently christen the Johnny Lightning as an FJ43 soft top. Now, on to the rest of the model. Accuracy looks great. All the tampos are there, the soft top made of hard plastic looks the part, and the wheels are brilliant. The engine looks very well detailed, and looks to be the standard 3.8L inline 6 F engine. No wiring, sadly, but the air cleaner, block, radiator, and battery are clearly visible. A nice touch is the blue battery, which looks pretty snazzy. As for fit and finish, this is where the model struggles a tiny bit. Overall I have sung the praises of Johnny Lightning’s models, as they all feel nice and weighty, sturdily put together, and overall very solid. This FJ mostly follows that standard, though the axles seem to be thinner than on most JLs, and the spare wheel was sadly loose in the packaging. Nothing a little super glue couldn’t handle, though, and the model rolls nicely, has all the right tampos correctly aligned, and the hood opens and stays open with confidence. For me, it’s hard to find a better put together model for around $6 than a Johnny Lightning, and that includes this FJ. It’s been a ton of fun to play around with so far, and to just stare at. The black makes it hard to get the full picture of all detail on the car, but I’m hoping that when I get some lighter color variants (and they will come soon, hopefully! ), I will be able to take some better photos. I got the model from KPS Hobbies and Toys, so major shoutout to them, who, like The Bell King said last week, definitely seem to be good peeps in this hobby of ours. Can’t wait to hit them up once they get some of the Mijo Exclusive FJs!